Sniper's-eye view of Southcenter. Not the most scenic way to show off your shopping mall, really, with a seedy shot taken from the weeds next to the highway, but whatever. :) Their current website. i actually enjoy these kinds of photos the most. the love of the retro design that you can always find in the 'better' shots is replaced by a kind of 'what the f**k' astonishment. LOL! That's true, too, Phil! Good point. 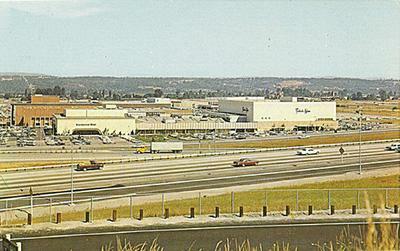 Perhaps this shot was intended to show the mall's proximity to the freeway...a significant advantage! Southcenter is my "home" mall, always has been! Nice 60s design (Tacoma Mall was built about a year before or after to extremely similar plans - ask at the Southcenter office to see old brochures and photos, same at Tacoma) Both have been modernized extensively, Tacoma by Simon, with ugly nonfunctional lantern sculptures and hideous arched entrance signs, and Southcenter has joined the ranks of Westfield and become "Westfield Shoppingtown Southcenter", though no one in their right mind calls it that. Both had great fountains, two here and four at Tacoma. One of Southcenter's and two at Tacoma were by some guy called "P. Billingsley" (he signed his bronze fountains in brazed letters) and neither mall has any fountains left. Billingsley actually made two identical ones for Southcenter, the first stolen during the night, months before the mall's opening - thieves actually broke in, unbolted the massive 9' tall sculpture and hauled it away! I have no clue what anchor is in the left foreground, but only the Bon Marche in left background, red brick (which recently became BonMacy's only to immediately become Macy's) and JCPenney (rear right) have retained their 60s looks. 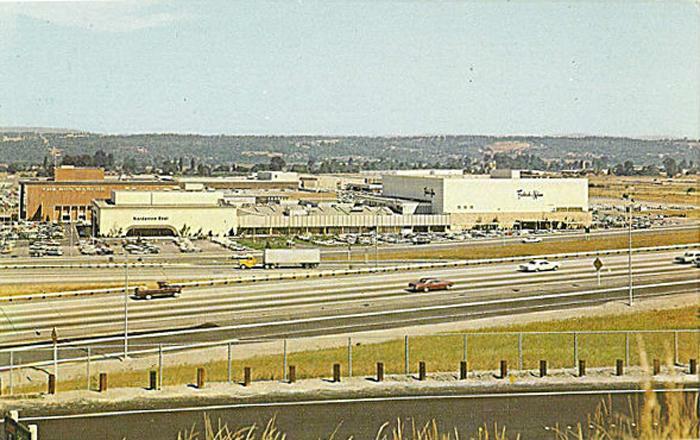 Left foreground was rebuilt at some point into Nordstrom, though I remember vaguely the old building with arched entrances. Like Bon Marche, Frederick & Nelson (right foreground) was a much-loved local chain - it folded in the mid-90s and Sears refaced the building in bland neutral colors. A Mervyn's anchor was built in rear left, way past Bon Marche. Actually I opened South Center as a young department manager in one of the stores. Pretty fun. The original fountain was actually a George Tsutakawa. It was stolen ( hoefully they didn't melt it down) and a new one was made by Billingsley because George was too busy. Billingsley was an assistant to George. The last I heard of him he was living on a sailboat in Quartermaster harbor, Vashon Island. That was 8 years ago or more. Very nice 60's style fountain. We call it "space lab". I think the George Tsutakawa fountains from Tacoma Mall were sold at a Poncho Auction. The anchor in the left foreground is Nordstrom Best. When Nordies was just a shoestore chain, they bought the Best clothing chain to expand into clothing (mid '60's). They dropped the Best name in early '70's. I'm not sure when they rebuilt into the current store. I used to work at Nordies in Portland, OR.